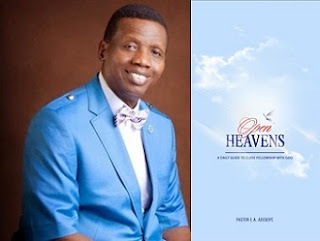 Open Heavens: Open Heavens 19 January 2018: Friday daily devotional by Pastor Adeboye – God’s Foot Soldiers? Open Heavens 19 January 2018: Friday daily devotional by Pastor Adeboye – God’s Foot Soldiers? The nations and kingdoms in this declaration are not just physical, they are spiritual. The Holy Spirit made this clear to us in Ephesians 6:12, and He also teaches us that the weapon with which we wage war in God’s army are not physical weapons (2 Corinthians 10:4-5). Are you presently fighting a battle in your life? This should serve as a template for you. Turn to God for victory and you shall be victorious through the Name and Blood of Jesus Christ (Luke 10:17, Philippians 2:10, Revelation 12:11). Action Point: Using the Name of Jesus, speak against every spiritual force contending with God’s plan for your life and family. Open Heavens 19th January 2018, Daily Devotional guide was written by Pastor E.A. Adeboye, the General Overseer of the Redeemed Christian Church of God, one of the largest evangelical church in the world and also the President of Christ the Redeemer's Ministries.